and stuffed with polyester toy filling. The sock monkeys are very soft to touch and squishy to cuddle. 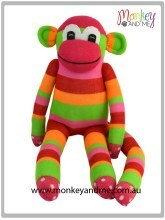 Tell a friend about this cute sock monkey!